The best-selling Rumi book ever is now better than ever! This revised and expanded edition of the comprehensive one-volume edition of America's most popular poet includes a new introduction by Coleman Barks, and 81 new poems never published before. The best-selling Rumi book ever is now better than ever! This revised and expanded edition of the comprehensive one-volume edition of America′s most popular poet includes a new introduction by Coleman Barks, and 57 new poems never published before. The ecstatic, spiritual poetry of Rumi is more popular than ever, and The Essential Rumi continues to be far and away the top-selling title of all Rumi books. With the addition of many new poems and a new introduction, The Essential Rumi is now clearly the definitive, and most delightful selection of Rumi′s poetry. "If Rumi is the most-read poet in America today, ColemanBarks is in good part responsible. His ear for the truly divinemadness in Rumi's poetry is truly remarkable." 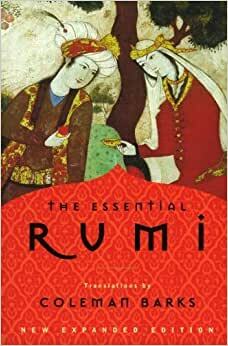 -- Huston Smith, author of "The World's Religions""In this.delightful treasury, Barks sparklingly demonstratesonce again why his free-form interpretations of [Rumi's] poetryhave been a major impetus for the current Rumi vogue." -- "Publishers Weekly""Perhaps the world's greatest spiritual poet--the gold of Rumipours down through Coleman's words. The words leap off thepage and dance!" -- Jack Kornfield, author of "A Path with Heart"""The Essential Rumi" is a rare and precious book that will stir the hearts of Rumi devotees and win many new converts." -- "Body Mind Spirit"
1.0 out of 5 starsColeman does not even speak Persian. These are plagiarized translations with huge liberties taken. Coleman Barks is NOT a translator. It is a fact that he cannot read, write, or speak Persian. He at first plagiarized the translations of other translators, like William Chittick, and later flipped the script and relented by claiming that he is just an Interpreter who “interpreted” others translations (but still prints his books as “translated by...” and gives no credit to the real translators). His interpretations however are white-washed (read the New Yorker article “The Erasure of Islam From The Poetry of Rumi” by Rozina Ali) and do not retain the true essence of Rumi. This book and Westerners’ mania over these translations is like an allegory for colonialism all over again. Invaded, stolen, defiled, and erased. 92 people found this helpful. 1.0 out of 5 starsI knew something was up when there was poetry about UFOs...from centuries ago? Before you buy this, research Coleman Barks. He doesn't read Farsi and therefore can't translate it, and he says that Rumi came to him in a dream with new poetry. 33 people found this helpful. 5.0 out of 5 starsRumi is truly timeless. I was introduced to Rumi in a college Religion course on mysticism, and fell in love with the depth found in the simplicity of his words. I now use this book as a "Magic 8-Ball" of sorts...if I have a problem, I flip through it and stop at random, and read through Rumi's answer for me. His poetry is beautiful and his wisdom leaps off the page into your heart: "you are not a drop in the ocean, you are the entire ocean in a drop," "maybe you are searching among the branches, for what only appears in the roots," are only a few of my favorites. 31 people found this helpful. 5.0 out of 5 starsTHE Rumi book to have. From what I have been able to figure out, this is THE Rumi book to have. 388 pages of poetry (ok, 388 pages does include intro, index, etc.) And even some recipes in the back. This book is what I was hoping it would be. If you want to read Rumi and don't know where to start, I suggest starting with this book! Rumi is well known. Not sure what to add other than please read if you haven’t already. Lovers of language, beauty, philosophy or any combination thereof would be hard pressed to find more insightful precise enchanting delicious poetry. Read...pause in delight...read...pause in delight...smile. Repeat as often as needed until you soul is full. 19 people found this helpful.